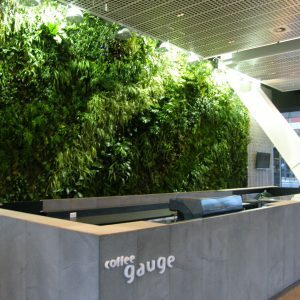 ‘The Gauge’ Greenwall sits behind the entry foyer café in the Lend Lease building located in the Melbourne Docklands.The intricate detail of the greenwall planting contrasts with the bold architectural steel angled columns and glass façade of the building structure. 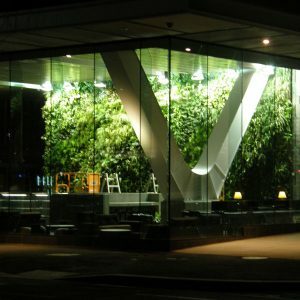 Viewed from the street the greenwall looks like an extension of the streetscape environment. 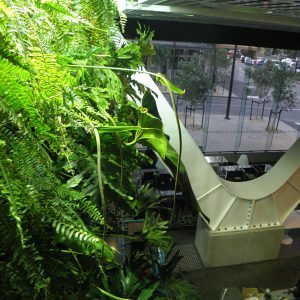 The natural light that cascades through the glass window wall throws angled rays across the planting face. 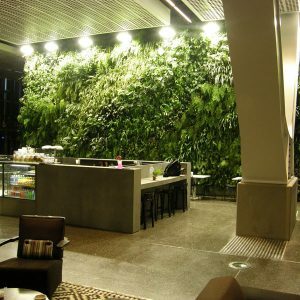 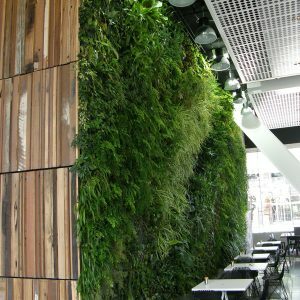 This greenwall is a successful example of how ‘The greenwall Company’s walls can survive and prosper in interior environments.